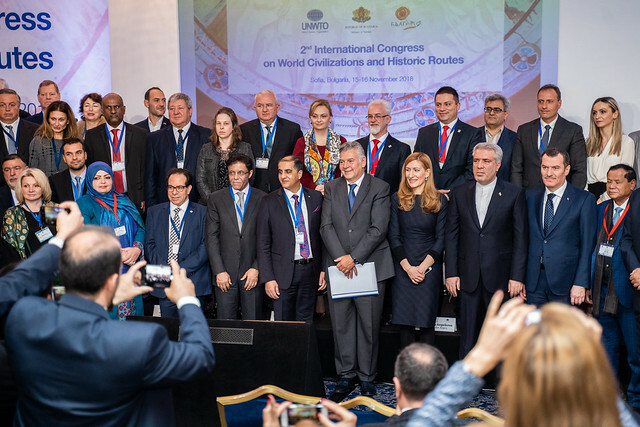 Jointly organized by the Ministry of Tourism of the Republic of Bulgaria and UNWTO, the 2nd International Congress on World Civilizations and Historic Routes was held on 15-16 November in Sofia, Bulgaria. Cultural heritage lies at the very heart of the collective memory and identity of the citizens of the world. Destinations that boast archaeological sites, ancient architecture, folklore traditions and arts and that find themselves along these ancient routes can assume the role of catalysts for exchange of experience between peoples and cultures through tourism development, and thereby promote sustainable growth, prosperity and peace in their own regions. Recognizing the above, the Congress explored the possible ways in which world civilizations could be brought to life through tourism, in particular by harnessing the potential historic routes offer for the enhancement of cultural heritage of destinations and the advancement of the Sustainable Development Goals (SDGs´). The congress produced a useful set of recommendations that can provide guidance to all tourism stakeholders interested in harnessing the potential that cultural heritage routes offer for enhancing the attractiveness and competiveness of destinations. Launched in 2017 as a joint initiative between UNWTO and the European Union, the UNWTO’s Western Silk Road focuses on the development and diversification of the Western link of the Silk Road, an area geographically defined to primarily include European Union Member States, but also partner countries located along the Mediterranean basin, the Caspian Sea and the Black Sea. The collaborative initiative integrates both a product development and capacity building components to successfully design strategies to foster sustainable tourism development along the Western Silk Road, with tangible and intangible Silk Road heritage as a unifying theme. The programme of the Congress is available here. Press release: "Harness Cultural Routes and Experiences for Competitive Tourism, Concludes UNWTO Congress"